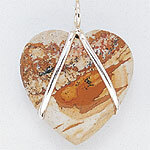 Heart shaped jewelry, pendants and necklaces (matching earrings available). 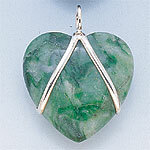 These heart shaped pieces of jewelry are made from African Jade, Picture Japser, Rose Quartz, and other unique minerals. 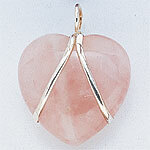 Aside from the romantic feelings generated by the heart shapes, each particular stone has a traditional meaning. 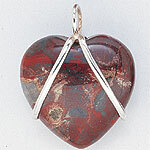 They are very fashionable and the sterling silver will help ensure that you will enjoy these pieces for years to come. Nuturing and Growth: Each pendant comes with a sterling silver bracket and hoop, and a black necklace cord. Available in two sizes. Large is 1.5 by 1.5 inches and sells for $29, while the small is .6 by .6 inches and sells for $19. 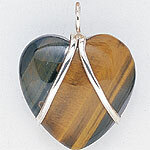 Love, Compassion and Empathy: Each pendant comes with a sterling silver bracket and hoop, and a black necklace cord. Available in two sizes. Available in two sizes. Large is 1.5 by 1.5 inches and sells for $29, while the small is .6 by .6 inches and sells for $19. Healing and Earth Energies: Each pendant comes with a sterling silver bracket and hoop, and a black necklace cord. Available in two sizes. Large is 1.5 by 1.5 inches and sells for $29, while the small is .6 by .6 inches and sells for $19. Insight and Intuition: Each pendant comes with a sterling silver bracket and hoop, and a black necklace cord. Available in two sizes. Large is 1.5 by 1.5 inches and sells for $29, while the small is .6 by .6 inches and sells for $19. Will Power and Strength: Each pendant comes with a sterling silver bracket and hoop, and a black necklace cord. Available in two sizes. Large is 1.5 by 1.5 inches and sells for $29, while the small is .6 by .6 inches and sells for $19. Balance and Relaxation: Each pendant comes with a sterling silver bracket and hoop, and a black necklace cord. Available in two sizes. Large is 1.5 by 1.5 inches and sells for $29, while the small is .6 by .6 inches and sells for $19. 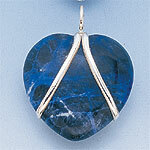 You can also purchase an optional Thai Silver Necklace Chain with this pendant if you would like. Just choose either the Ball Chain or the Link Chain in the drop down menu above (right above the Add To Basket button, where it says "Pick An Optional Chain"). If you don't want a chain, then just leave it as saying Select One. 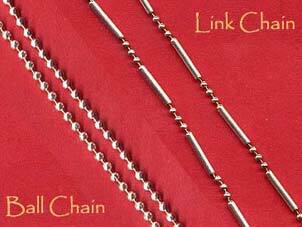 The Ball Chain Necklace (left) is 17 Inches Long and the Link Chain Necklace (Right) Is 18 Inches Long. Each ball or link is approximately 2 milliliters in diameter. We think you are going to like these chains as they are made out of genuine Thai silver and really make our pendants / amulets stand out. They add a touch of class to our pieces.